Wishing you 365 days of rocking fun!24/7 days smiles N success 24/7 days cheers N laughter Have amazing fantabulous New Year.. I met love, health, peace and joy,They needed a permanent place to stay.I gave them your address hope they arrived safely ..
You see people making new resolution,People are giving their life another restart..Here I give you NEW YEAR Wishes !! 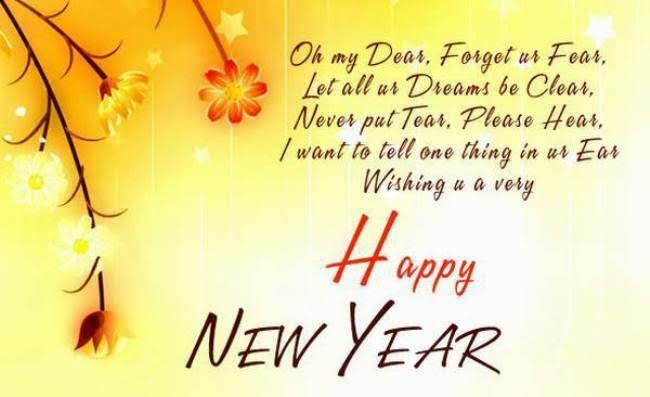 !before any other give starts ..So accept my New Year wishes Messages. Receive my simple gift of LOVE..Wrapped with SINCERITY..Tied with CARE and Sealed with BLESSINGS..To Keep u HAPPY and SAFE all the life long. Nights are dark but days are light,Wish your life will allways be bright..So my dear mever get fear..Bcoz Allah gifts us a brand new year.. Lets welcome the year which is fresh Lets welcome the year which is fresh and new,Lets cherish each moment it beholds,Lets celebrate this blissful new year..
A happy New Year! Grant that I May bring no tear to any eye When this New Year in time shall end Let it be said I’ve played the friend,Have lived and loved and labored here,And made of it a..
With all the Rose’s Perfume and with all the lights in the world and with all the children Smiles…I Wish U that all your dreams comes True..
Hope The New Year brings a lot of good cheer for you,May all Your Dreams Will be True,Hope the year also bring Gigabyte of Fun,Happy New Near and good luck with your Resolution. Aaj theke onek dure, smritir kathar pore, abcha hoye amay jodi abar mone pore, 1bar kaan pete suno amar dak, bujhiye bolo samay take ektu theme thak. Ekti bochor periye gelo hawar sathe bhese.Notun bochor esheche, take jotno kore rekho Shopno gulo sathi kore khub bhalo theko. Chawa gulo pawa hok. asa gulo purno hok.sopno gulo sotti hok. dukkho gulo beday hok.notun bochorer din gulo sobar valo hok. Bondhu tomar valobasar janala khola rekho,Moner akas meghla hole amay kintu deko….Jhor bristy katiye abar dekhabo aalor hashi,Ami achi, thakbo jeno tumar pasa-pasi. Misty alor jhikimiki shobuj ghase ghase,snigdho haway duliye matha fuler koly hashe,Pakhir gaane poribeshe mayabi ek dhoa,dilam tomay notun bochorer choya. Sukher Sriti Rekho Mone, Dukher Sriti Jeo Vule, Mishe Theko Aponjone Prane, Man Oviman Sob Vule, Ashar Prodip Rekho Jele, Hajar Surjo Tomar Chokhe, Sabai Mile Theko Sukhe. Dingoli jamoni houk thik e jai kata,Tobe bolo lav ki porono sriti geta,A Bochore puran houk tur sokol aasa,New Year a Tur jonna ata e kori Prottasa. Noton bochor asok niya noton noton aasa Prithibite choriya dik sudue valobasa.Hana hani,Vedavad sob kichu voli Aso soba mila misa Sot potha choli.Sobaika New Year ar Soveccha.